w/ginger, garlic & spring onions. Shrimp, mussels, scallops & fresh fish. Cooked in a Cream Base. Marinated grilled chicken, with our Baby spinach, Romaine Lettuce, Avacados, Tomatoes, Cucumbers, Onions and Olives. Covered with Sauce and Monterrey Jack Cheese. Served with Rice Beans, Lettuce and Pico de Gallo. Pico de Gallo and pinto beans. All plates are served with Mexican rice, shredded lettuce, Pico de Gallo and pinto beans. 1.Cheese enchilada, guacamole taco, Cheese quesadilla. 2. Beef enchilada, Chicken Enchilada,chicken taco. 3. Ground beef enchilada, Beef Taco, cheese Quesadilla. 4. Cheese Chile Relleno, beef Taco, chicken Enchilada. 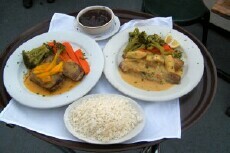 Served with Black Beans and Steamed Vegetables. 12 oz Chargrilled Ribeye with Sauteed Spanish Onions. 12 oz Chargrilled Ribeye Sauteed with Garlick Butter and Cherry Wine Sauce. 12 oz Chargrilled Ribeye with three Shrimp. Sauteed w/garlick butter and cherry wine sauce. Six jumbo shrimp stuffed with cheese and jalapenos, wrapped in bacon, and served on a sizzling platter. Half Rack of Baby Pork Ribs with BBQ Sauce. Cuban style morsels of pork marinated in criollo sauce, roasted in Seville bitter oranges. Roasted half chicken marinated in criollo sauce and topped with sauteed Spanish onions. Chicken breast sauteed with fresh tomatoes, cilantro, jalapenos, green, red, and yellow bell peppers, onions, scallions, potatoes,and our special Peruvian wine sauce. 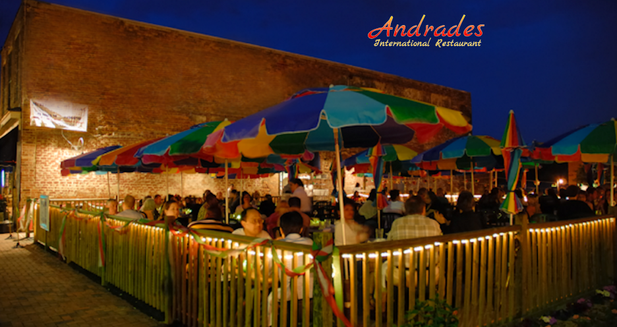 Prime tenderloin strips sauteed with fresh tomatoes, cilantro, jalapenos, green, red and yellow bell peppers, onions, scallions, potatoes and our special Peruvian wine sauce. Grilled salmon with shrimp, topped with seafood sauce. Shrimp and scallops sauteed with fresh tomatoes, cilantro, jalapeno, red, green and yellow bell peppers, onions, scallions, potatoes and our special Peruvian sauce with clam juice. 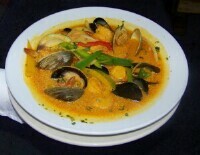 A seafood casserole of scallops, shrimp, fresh fish, squid, mussels and clams, cooked with sherry wine and Spanish herbs. Served with Lettuce, Guacamole, Sour Cream, Pico de Gallo, Cheese and Beans. All of our Salads are served with our Famous House Dressing. Covered with Sauce and Monterrey Jack Cheese. Served with Rice, Beans, Lettuce and Pico de Gallo. Served with Flour Tortillas, Mexican Rice, Pinto Beans, Guacamole, Sour Cream and Pico de Gallo. All Fajitas are served on a Sizzling Platter with Grilled Onions, Peppers and Tomato. Half Rack of Baby Pork Ribs, 6 Jumbo Shrimp, Half pound Chicken, Half pound of Steak. Whole Rack of Baby Pork Ribs, 8 Jumbo Shrimp, 1 Lb. of Chicken, 1 Lb. of Steak. 1/2 Lb. Steak, 1/2 Lb. Chicken and 6 Jumbo Shrimp. Romaine Lettuce, Corn, Black Beans, Tomatoes, Avacados, Cucumbers, with BBQ Grilled Chicken. (Three Jumbo Shrimp stuffed with Cheese and Jalapeno wrapped in Bacon & Three Sea Scallops wrapped in Bacon).